Cpt. 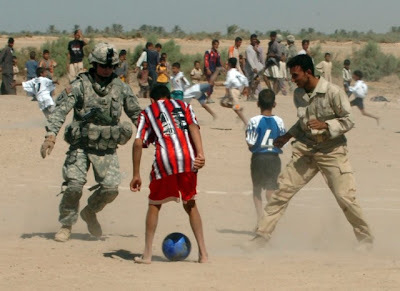 Olivera Rodriguez of the the 2nd Battalion, 320th Field Artillery Regiment, gets in a little soccer practice with the local youth and adults during a pickup soccer game Saturday in the Ad Dujayl area. The 2-320 FAR, provided security while local children and adults participated in pickup soccer games to help strengthen the relationships between coalition forces and Muslims in the area. Photo by Spc. Michael Behlin.